An English translation of the title-page appears below (Fig. 2). 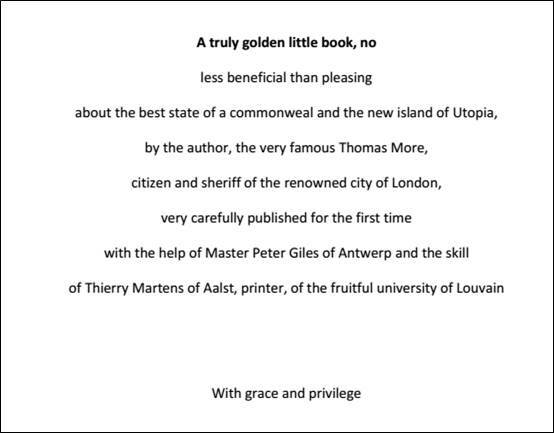 Note how it talks about ‘the best state of a commonweal and the new island of Utopia’; it does not state that Utopia represents ‘the best state’ that a commonweal can achieve. The title thus evidences an ambivalence towards Utopia: it is not presented as the ideal state that it is sometimes perceived to be in current, popular usage. This ambiguity is also expressed in the name ‘Utopia’, which is a Greek pun on ‘Outopia’ (no place) and ‘Eutopia’ (good place). The title page also mentions the assistance of Master Peter Gilles of Antwerp. Gilles was an actual historical person and features in the dialogue, alongside Thomas More and the (fictional) Raphael Hythloday, whose surname – either ‘disseminator of nonsense’ or ‘destroyer of nonsense’ – is as slippery as the name of the island he visits. The 1518 edition of ‘Utopia’ includes a woodcut depicting the three interlocutors in the dialogue (More, Gilles, and Hythloday) as well as More’s servant John Clement (another real-life figure), who overhears some of the conversation but says nothing (Fig. 3). 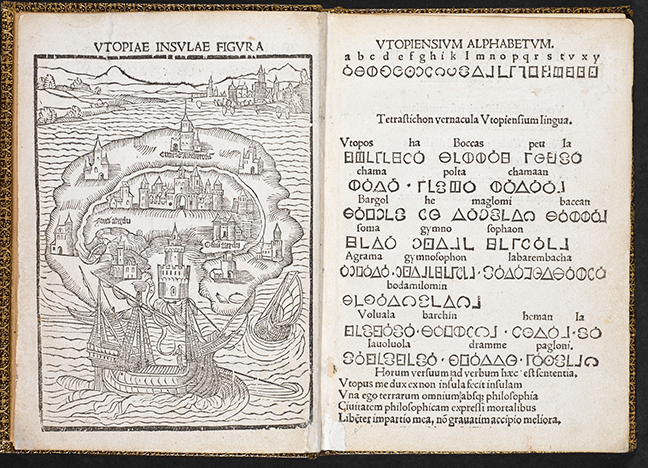 ‘Utopia’ quickly became a European best-seller, translated into many of the major European languages (German in 1524; Italian in 1548; French in 1550; Dutch in 1553; Spanish in 1637); it continued to be printed in Latin too, including in a smaller, more portable octavo format in 1517. 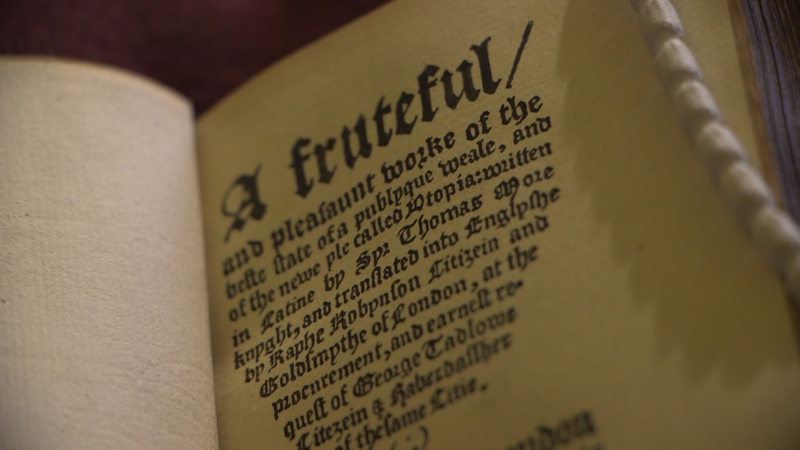 The first English translation, produced by Ralph Robinson, was printed in 1551; a revised edition followed in 1556. Both these translations lack the map, the Utopian alphabet, and the woodcut of the interlocutors found in the Latin editions. Presumably this was for reasons of cost: producing these bespoke woodcuts would have been expensive, particularly as – unlike many more generic woodcuts – they could not have been reused in other publications: they are too specific to this one text to be recycled. 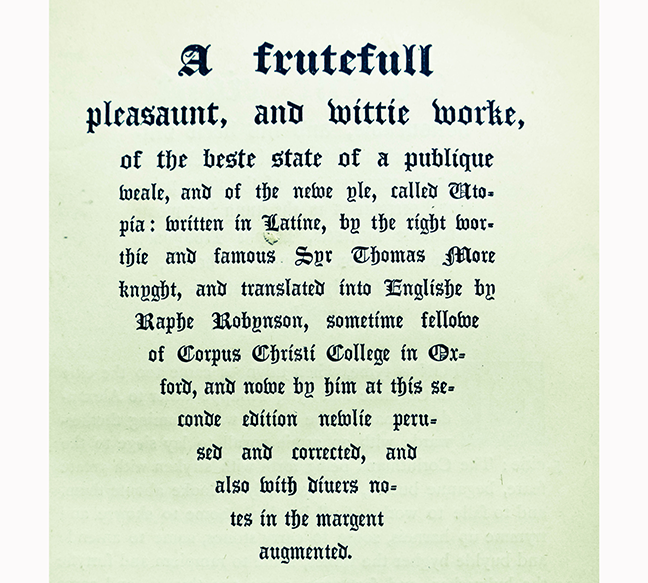 In contrast, the 1556 title page emphasises Robinson’s scholarly credentials: as ‘sometime fellow of Corpus Christi College in Oxford’. Further to that, it assures the reader that this edition is different from the previous one: it is ‘newly perused and corrected’, and has additional marginal notes (‘divers notes in the margent augmented’). 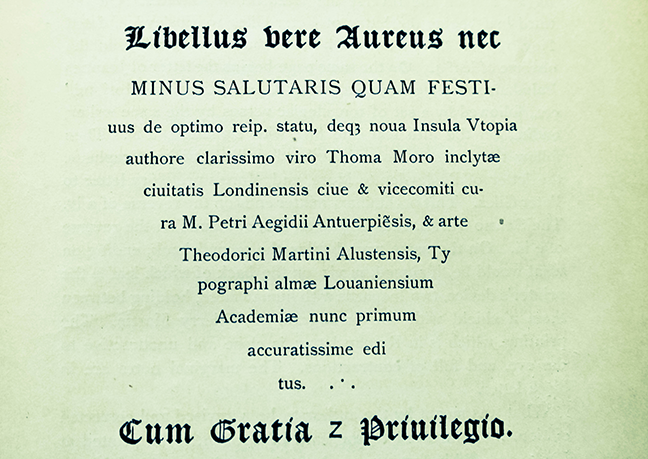 16th-century title pages often advertise the ‘new’ or ‘improved’ content of the work that follows (not always truthfully) in a bid to attract customers. 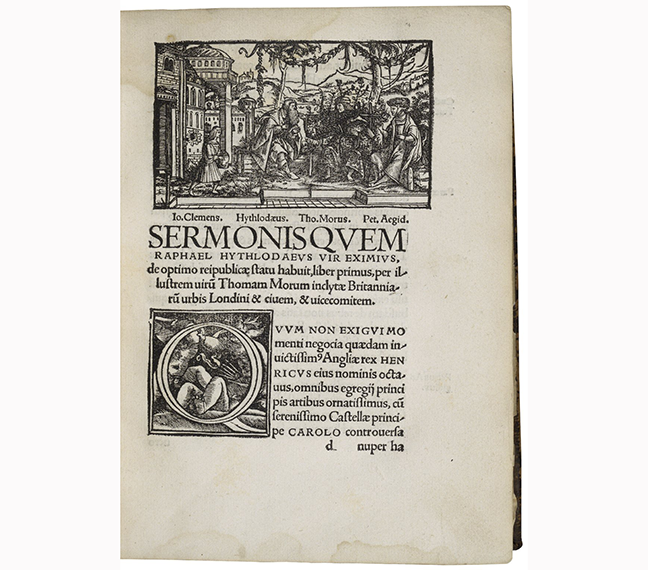 Robinson’s 1556 version of the text was reprinted three more times in the 16th and 17th centuries, before it was superceded by Gilbert Burnet’s translation, first printed in 1684. By this stage, the work was sufficiently well-known to be entitled simply ‘Utopia’, without the longer descriptive title found on earlier versions (in both English and Latin). 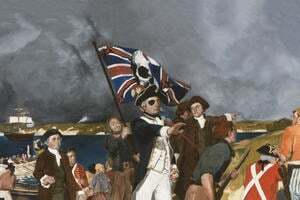 Burnet’s version was the standard translation throughout the 18th century and the first half of the 19th century, but Robinson’s version saw a revival in popularity after the 1850s, as his older Tudor prose came to be seen as more authentic. 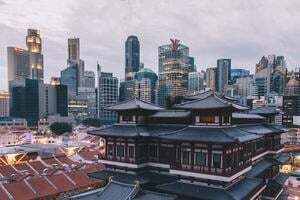 More’s ‘Utopia’ also spawned an entire genre of writing: ‘Utopian’ fiction, a genre categorised by a traveller’s description of a very different socio-political system. Early examples include Thomas Lupton’s ‘Sivquila’ (1578), Tommaso Campanello’s ‘La città del Sole’ (1602), Francis Bacon’s ‘The New Atlantis’ (1627), and Margaret Cavendish’s ‘The Blazing World’ (1666). 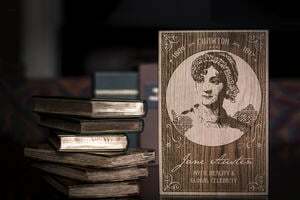 However, some of the most famous instances are from the later 19th century, a time of rapid social change which saw a flourishing of the genre: Samuel Butler’s ‘Erewhon’ (1872); Edward Bellamy’s ‘Looking Backward’ (1888), the third best-selling book of the 19th century in the USA (after ‘Uncle Tom’s Cabin’ and ‘Ben-Hur’); and William Morris’s ‘News from Nowhere’ (1890).